rooftop ride in Tokyo Japan is filled with amusement parks and theme parks. Visitors to amusements parks typically spends ¥3,000 to ¥5,000 while visitors to theme parks spends ¥5,000 to ¥10,000. At amusements parks ticket receipts make up 60 percent of the sales. At theme parks ticket receipts make up 40 to 50 percent of the sales. The rest comes from the sales of souvenirs, food and beverages. Many of theme parks and amusement parks in Japan have been built with money from local governments and commercial banks. The national government often pushed the projects as a way of promoting local development. One Japanese company makes virtual reality aquariums consisting of three screens, each 1.5 meter high and 2.2 meters wide that display images of swimming dolphins and whales and other marine life. Japan is filled with Ferris wheels. You can event find them sprouting it of the top of buildings as is the case with one protruding from the 10-story-high Hep Five shopping mall in Umeda, Osaka. 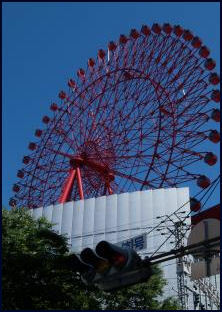 For a long time Japan was home to the largest Ferris wheels in the world. Only recently have larger ones been built outside of Japan in places like Singapore and London. Technically most of them are observation wheelsnot Ferris wheelsthat largely rotate with the help of their own weight, rather than a true Ferris wheels which have powerful motors that push the wheel around at a faster clip. Observation wheels move so slowly they often look as if they are not moving. People step on and off as the wheel arrives at the landing platform while it is moving. 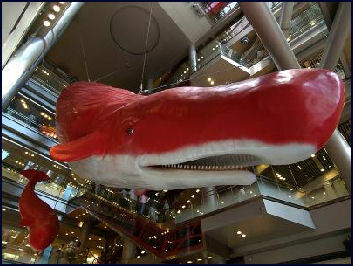 shopping mall whale in Osaka Tokyo Disneyland, Japan's first theme park, opened in April 1983. It was soon followed by others. Many were built by private railroad companies in the suburbs to generate income for their railroad lines. At one time Japan was home to 60 theme parks, many of them with foreign themes. The depressed former coal mining town of Ashibetsi in Hokkaido created Anne of Green Gables Land, with a handful of Canadian actors. Tohuko had a Swiss village with "Heidis cottage and a view of the Matterhorn." In Niigata, there was a Russian village with trained seals straight from Lake Baikal. In Noboribetsu there was full scale model of the cattle found in Hans Christian Andersons hometown. There were New Zealand valleys in Hiroshima, Yamaguchi and Shikoku which with their own sheep shows. Some of the sillier parks include Bow Wow Kingdom with sunbathing puppies; Tom Sawyer Pasture, with Vietnamese pigs; Mongolian Village, where young people live in a yurt. Major theme parks in Japan include (year opened, number of visitors in 2007): 1) Tokyo Disney Resort Chiba Prefecture (1983, 24.52 million); 2) Universal Studio Japan, Osaka Prefecture (2001, 8.7 million); 3) Huis Ten Bosch, Nagasaki Prefecture (1992, 2.19 million); 4) Namco Namja Town, Tokyo (1996, 2.16 million); 5) Shima Spain Village, Mie Prefecture (1994, 1.58 million); 6) Sanrio Puroland, Tokyo (1990, 1.25 million); 7) Toei Movie Land, Kyoto Prefecture (1975, 1.04 million); 8) Tokyo Joyopolis (1996, 850,000); 9) Kurashiki Tivoli Park, Okayama Prefecture (1997, 750,000); and 10) New Reoma World, Kagawa Prefecture (2004, 710,000). rooftop ferris wheel in Osaka In August 2003, a car on the worlds longest roller coasterthe Steel Dragon at Nagashima Spaland in Nagashima, Mie Prefecturepartially derailed and stopped suddenly while it was upside down, 25 feet above the ground. It didnt fall off the track. but two people were seriously injured and other had t be rescued with a cherry picker. The accident was caused by a broken bolt in the wheel. Bolt problems had been reported earlier but not acted on. In 2003, two people were killed in Mitake-mura, Nagano prefecture, when they fell 15 meters from a cable car gondola whose window and door frame broke loose. It turned out the cable car had not been inspected for over 10 years. In August 2004, three elementary school students, were injured when a zero gravity simulator in Niigata when the capsule they were riding in fell from a height of seven or eight meters, The injuries were not serious. Somewhat of a big deal was made when a 300-kilogram part fell off a float during a parade at Tokyo Disneyland. No one was hurt but the accident was widely shown on television. 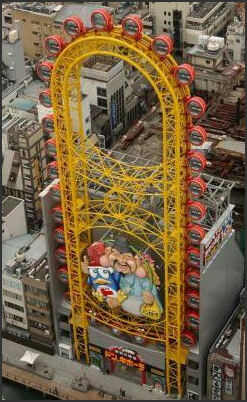 Joypolis recorded more than 50 accidents between 1996 and 2004 when a visitor died in the skydiver tower. The accidents included broken bones and getting wedged between equipment. The death was caused when a disabled man fell to his death his because his safety harness was no set correctly, leaving enough space for him to slip out. In December 2010, a girl sustained injuries in the same park after part of another roller coaster fell on her. In November, again at the same park, the fingers of a female maintenance worker were severed while she was performing safety checks on the ride. In May 2007, two people were killed and 19 were injured after a roller coaster partly derailed when an axle on one the cars broke at Expoland amusement park in Suita, Osaka Prefecture. The accident occurred on a stand-up variety roller coaster, carrying 20 people. One of the dead was a woman who slammed up against a handrail on the side of the roller coaster track. Witnesses said they saw parts from the roller coaster car fall off before the accident. The Expoland accident was blamed on metal fatigue in the axle, a problem that should have been picked in inspections. Two senior officials ay the amusement park were charged with professional negligence for postponing inspections. and submitted falsified documents they said they had carried out inspections when they hadnt. In September 207, Expoland suffered another roller coaster mishap when an inverted coaster was supposed to automatically stop but didnt and took 10 passengers for a second trip. No one as injured. Expoland had only been open for a month after being closed for 97 days because of the first accident. Expoland was forced close again. It never reopened. The company that ran it declared bankruptcy. A survey in August 2007 found flaws at 59 roller coasters and similar rides at 47 amusement parks. Another survey found that 40 percent of roller coasters were untested for axle cracks like these that cause the accident at Expoland. Many of Japan theme parks were conceived in the 1980s at the height of the Bubble Economy. Many opened around the same time in the early 1990s and initially made a big splash but most went on to lose money and were verging bankruptcy in the 2000s. Many were conceived by old men who tried to recreate the adventures they had traveling in foreign laws. The result was places like Spain Village, Dutch Village and Hawaiiland. Young people found the parks poor replacements for visiting the real thing. Kurashika Tivoli Park closed at the end of 2008 with debts of over ¥14.3 billion. Financed by the prefectural government, it opened in July 1997, attracting 2.98 million visitors its first. It attracted only 2 million people its forth year and less than 750,000 in 2007. Canadian World opened in 1990, in part to bring in new revenues, for a depressed coal-mining town that was losing its mines. After seven years the park was $50 million in debt and forced to close down. Between 1997 and 2001, the number of people who went to amusement and theme parks dropped from 131 million to 86 million, and one fifth of Japans amusement and theme parks were forced to close. The trend was blamed on the weak economy, competition from video games, decreasing number of children, and reluctance of banks to bankroll new rides ro attract new customers. In the 1960s, Yubari was a prosperous mining town with a population of 120,000. By the early 2000s, it was saddled with $500 million in debts, which worked out to about $40,000 for each of the townss 12,828 inhabitants. In 2006, the local government consolidated 11 schools into four, cut back on snow removal, closed libraries and museums, raised taxes, began charging hefty fees for water and sewage and made other changes to pay back the debts. About half of the towns 300 municipal workers were laid off and the those that stayed on had salary cuts of 30 percent to 70 percent. The cuts was so thorough and severe that the toilets in Yubari station were closed, forcing those in need to use a hotel next door, and the hospital-turned clinic could no longer offer things like kidney dialysis, forcing people who needed such treatments to go elsewhere or die. Not making matters any better as Yubari looks ot the future is the fact that 40 percent of the towns residents are over 65 and 8 percent is under 8, making Yubari the most aged town in Japan. ice cream UFO catcher Some theme parks have made a come back by marketing themselves to families and women, demographic groups most likely to generate repeat customers, offering special discounts and coming up with new attractions and events to bring in customers and take advantage of characteristics that make the parks unique. The fact that most parks are accessible by train and high fuel prices have made road trips and overseas travel prohibitively expensive have not hurt either. To make up for declining numbers of visitors, zoos are doing more to attract adults with events concerts with wine, light shows and lectures on mental healthcare for the animals. American companies have being buying bankrupt entertainment ventures and golf courses and making them profitable. Seagaia was bought by the privately equity firm, Ripplewood Holding, who turned into a profitable resort. In 2001, Ripplewood paid $125 million for Seagaia, invested another $125 million in it and won a cancellation of about $3.5 billion in debt. Under Ripplewood management, the golf courses became so popular they could charge $300 green fees and the hotels were booked with weddings and meetings. The company couldnt figure out what to do with the water park which cost as much as $25,000 a day to maintain and was drawing only 100 customers, who paid $9 each, a day. arcade game The amusements found at Japanese game centers generally fall into five categories: 1) crane games such as UFO catcher in which players try to pick a prize such as a stuffed animal by manipulating the grasper of a small crane; 2) photo sticker machines such as Print Club; 3) music-based games such as Dance Revolution ; 4) trading-card games such as Mushi King; 5) vintage games such as Space Invaders and Elevator Action; and 6) the driving and shooting games that have been the fixture of arcades as long as anyone can remember. Before arcade and video games took over the Japanese equivalent of pinball machines were ¥10 game machines that were often placed at department stores and Mon-and Pop candy stores. In one game players use levers to try to maneuver a ¥10 coin into a hole. Other include a dice throwing game and a rock-scissors-paper game. SEGA (SErvice GAmes ) was founded after World War II by entrepreneurs from Hawaii who felt there was money to be made by providing pinball machines and other ways for American servicemen stationed in Japan to amusement themselves. The company, founded by three Americans, was originally called Standard Games but it changed its name to SEGA when it moved its headquarters to Tokyo in 1951. Among the popular arcade games found in Japan driving games, fighting games, dancing games, game that feature battles between insects, goldfish scoops and games in which players use miniature cranes to pick up live lobsters, gold fish or stuffed Winnie the Poohs. Some animal rights groups have protested about the game with live lobsters. arcade game The biggest video game craze in the mid 2000s was Mushi King: the King of the Beetlesa game that involved separately buying cards with images of large beetlessuch as the Giraffe stag-beetle, the saw-tooth stag beetle or the Thailand five-horned beetleon them and various information and feeding them into an arcade machine that show 3-D images of the beetles battling to the death. Mushi King (Bug King) was introduced in 2003 by Sega who made money both from the selling of the cards and from the machines that played the cards. The game and cards were especially popular with preteen boys who fed cards into machines at toy stores and arcades. As of March 2007, 420 million cards and half million copies of the software that allowed the game to be played at home on Game Boy or PlayStations had been sold. At its peak more than 13,000 Mushi King arcade machines were in 5,200 locations. There are 856 Mushi King cards, each one with a real beetle species. They sell for ¥100 a piece and are available only from the arcade machines. Each card carries a number that measures the beetles strength and stamina, which can be enhances with supplemental special skill cards. The beetles use moves like those found in profession wrestling. Each has a special Finishing Attack such as a Running Cutter, Tornado throw or Rolling Smash which it use to finish off an opponent. 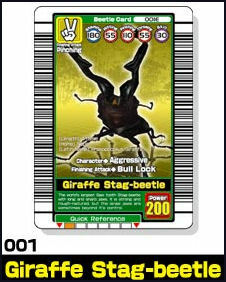 Cardholders can battle other cardholders or beetles on the machine. The battles begin after the machine scans the bar codes on the cards. Players chose when and how to attack and the outcome is based as much on their skill and the values on their cards. Mushi King is a make-believe version of an insect fight staged in a small ring such as those held between crickets in China. There is a television animation series that goes along with the game as well as merchandise such as lunchboxes and gloves. 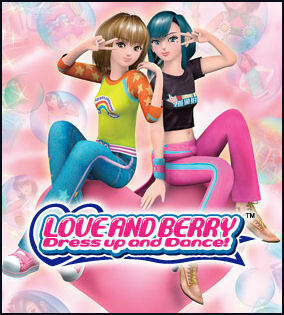 Players earn points by dressing up two witches, Love and Berry, and getting to dance. Players chose how the witches will prepare for a dance by feeding Oshare Maho (magic makeover) cards with hairdos, dresses and shoes into the machines. Participant can earn points by rhythmically pushing buttons as the witches dance with the winner being the one who is most stylish. 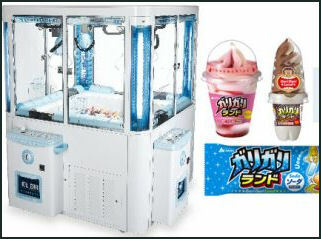 The machine charge ¥100 for each card and playing of the game. 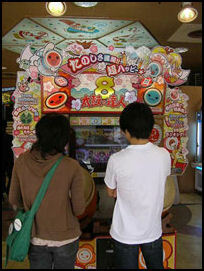 The machine were installed in shopping malls and arcades in October 2004. As of March 2007, 240 million cards had been sold and a total of 164 cards, with hairdos, clothes and shoes, had been issued with the 88 cards of the 2005 Spring and Summer Collection being auctioned online for ¥10,000. A similar online girls game features Japanese schoolgirls competing in dancing contests. The mastermind behind Love and Berry and Mushi King is Hiroshi Uemura, the head of a game development team at Sega that was on the verge of being shut down before the success of Mushi King, which was designed to be a game that parents and children could enjoy playing together. arcade game Japans arcade business has been suffering as result of competition from video games, with Sega Sammy Holdings and Namco Bandai both closing down a number of their arcades.. The first blow occurred after the introduction of Sonys Playstation. A bigger blow occurred with the arrival of Nintendos Wii, which has robbed arcades of the one advantage they had over video gamesbeing the best place to play active games. .Competition is also come from flat screen televisions and new consoles that have cutting edge graphics and sound that can replicate the arcade experience at home; and computers, cell phones, the Internet and hand-held consoles that offer people the chance t play a wide variety of games almost anytime, anywhere. High gas prices and crackdowns on loitering youths have also contributed to the decline. The number of arcades shrunk by half between 2000 and 2009 to 19,213. Many people are just getting tired of arcades. One 15-year-old boy told Reuters: Arcades are expensive, noisy and filled with cigarette smoke, adding that he would rather go to a theme park. Analysts say that arcades will make a come back if a new big thing comes along that cant be played at home. Some arcades are trying to win back customer by having visits by Ultraman and other events. An increasingly large percentage of the customers at game arcades in Japan are the elderly. In some places 30 percent of the customers are elderly. This is both a product of young people using arcades less and the elderly having a lot of free time and are looking for something to do. One of the more popular games among the elderly is a medal game in which players try to collect medals that allow them to play more games. Text Sources: New York Times, Washington Post, Los Angeles Times, Daily Yomiuri, Times of London, Japan National Tourist Organization (JNTO), National Geographic, The New Yorker, Time, Newsweek, Reuters, AP, Lonely Planet Guides, Comptons Encyclopedia and various books and other publications.